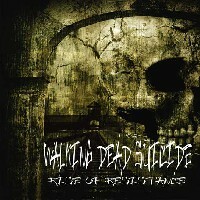 Walking Dead Suicide are a progressive death metal band from Helsinki. Featuring members of Difuse Content Band and Fitcone, they aspire to create epic tracks described as ‘atmospheric, dark death metal without limits’ in their own words. The measured pace and down tempo drums betray an affinity for sludgy old school DM, while the extended song lengths and meandering song structures give them their ‘prog’ credentials. The first thing that struck me is just how similar their vocalist is to Erik Rutan of Hate Eternal. If someone played me a track from The Rise Of Resistance I’d swear it was an early demo of his. Musically the ambition is plain, but the epic, labyrinthine music Walking Dead Suicide so eagerly want to create is beyond their range so early in their career. Whether it’s through inexperience or a hurry to get an album done, the end result feels a little hollow. Some experimental sections seem to be put in at random, purely for the sake of extending and (or) disrupting the song. The solo’s also appear improvised somewhat and once again, through overreaching or bravado, they don’t compliment the music that backs them. You can never fault musicians wanting to push their own abilities and attempting to create complex music, but I feel that a little more thought and time in the studio would have reflected Walking Dead Suicide‘s vision more accurately. Unfortunately in its current state, The Rise Of Resistance is the sound of a bands reach exceeding their grasp. This entry was posted on 14th June 2012 at 9:45 pm and is filed under CD, Experimental, Metal with tags Hate Eternal, helsinki, Progressive Death Metal, unsigned, walking dead suicide. You can follow any responses to this entry through the RSS 2.0 feed. You can leave a response, or trackback from your own site.